Today is National Junk Food Day. I'm the first person to admit - I have a junk food problem. Given a choice between eating something healthy and eating junk, I'll choose junk 95% of the time. Unfortunately these food choices have had quite a negative impact on my health. In the past 14 years, I have put on a LOT of weight. I used to blame this on having had 5 children, but the youngest is 6 so I no longer have that as an excuse. In addition to my weight, my energy level is stinky! By mid-afternoon, I'm ready for the day to be over. Since most of my running around transporting small people to activities happens in the late afternoon and evening, this is a problem. I've decided to make some changes. Weight Loss - Many (most) junk foods are high in calories, leading to weight gain. By eliminating these foods, I can lower my caloric intake and burn more calories than I eat. This should help with reducing my weight (of course, with exercise as well). Improved Nutrition - By cutting out (or cutting down) junk food in my diet, I will increasing my intake of foods that provide the appropriate vitamins and nutrients my body needs. 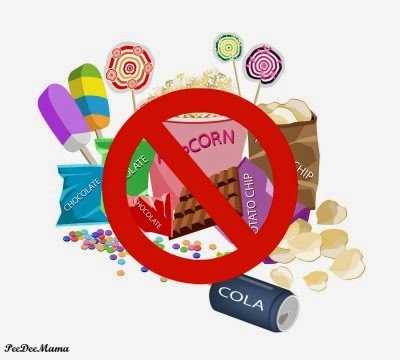 Reduced Health Risks - Obviously junk food has terrible effects on health, increasing the risk of heart disease, high cholesterol, kidney disease, high blood pressure, and diabetes. Cutting out junk food lowers all of those risks. Improved Mental and Emotional State - It stands to reason that if I improve my physical health, I will improve my mental and emotional health as well. I've noticed that when my blood sugar is on a roller coaster ride due to my poor food choices, my mood follows that same roller coaster. I become jittery and irritable; basically I'm not a fun person to be around. Now I'm trying to find some healthy alternatives for my junk food snacking. I've replaced munching M&M's with munching almonds. I'm adding more veggies to our meals. I don't want to just change how I eat, but also get the small people to make healthier choices as well. Share with me - What are some family-friendly healthy recipes you like?